Western NY, fall hen steelhead (netted) that took a John Nagy Lake Erie Emerald Shiner Tube Fly on the swing. Note: fly is predominately white but is stained from stream bank sediment. As of November 27th, the Lake Erie water temperature (degrees F) off Toledo was 38 degrees, off Cleveland was 44 degrees, off Erie was 42 degrees and off Buffalo was 43 degrees. Lake Erie steelhead (smolt) stocking numbers for 2017 include (1,857,271 total): PA (1,032,421), OH (442,228/34% decrease from 2016), NY (267,166), MI (60,706) and ON (59,750/1200% increase from 2016 due to switch from fall steelhead fingerlings to spring smolts). A total of 1,857,271 steelhead and 5,000 domestic strain rainbow trout (these rainbows were stocked by the NYSDEC/see brown trout discussion below) were stocked in 2017. This represents a 5% decrease from 2016 but close to the long-term average (1990-2016). The primary stocking strain of steelhead in Lake Erie for New York is the hatchery, fall/winter running Chambers Creek/Washington State strain (7% of the total steelhead stocked). Pennsylvania stocks the hatchery Trout Run or Lake Erie strain (55%) which is a fall/winter runner that has been described as a “mutt” due to its Chambers Creek, Skamania and domesticated rainbow background. Ohio and Michigan stock the spring running wild Little Manistee/Michigan strain (11%). (See notes below for Ohio variation in 2017/2016). Ontario stocks a limited number of fall running wild Ganaraska River/Lake Ontario strain steelhead (7%) since their steelhead runs are primarily based on natural reproduction. Pennsylvania impressively attained its baseline target stocking of 1 million steelhead smolts for the 14th consecutive year with the combined efforts of the PF&BC and the sportsman's cooperative nurseries. Average mean length of yearling steelhead stocked by Lake Erie stocking agencies in 2017 was 180 mm. MI averaged 194 mm, PA averaged 190 mm, OH averaged 194 mm and NY had the smallest size at 113 mm. Notes: The New State Department of Environmental Conservation (NYSDEC) tagged and marked a number of steelhead smolts using a combination of fin clips and coded-wire tags in 2015 and 2016. No steelhead were marked or tagged in 2017. The NYSDEC steelhead stocking in 2017 was above the stocking target due to a surplus of fish in the NYSDEC Salmon River Fish Hatchery. Specifically, 203,000 surplus fall fingerling steelhead were stocked into Cattaraugus Creek (which is the second year in a row surplus steelhead were stocked in the Cat). These fingerlings are a summer run strain originating from the Washougal River in Washington State which are expected to run earlier in the Cat (August/September) than NY’s Chambers Creek strain which run in good numbers starting in October. Also, due to Michigan Little Manistee egg source limitations, the Ohio Department of Natural Resources, Division of Wildlife (ODW) stocked both Wisconsin DNR Chambers Creek and Ganaraska strain steelhead into Ohio’s steelhead tributaries in 2017. This same scenario occurred in 2016. Normally, the ODW had stocked exclusively Little Manistee strain since 1998 (with a annual target of 400,000 steelhead smolts). The Wisconsin Chambers Creek and Ganaraska strain steelhead (whose origin is Wisconsin steelhead rivers of Lake Michigan) run very similar to Michigan Little Manistee (late winter/early spring) and have similar return sizes. The DOW also stocked the Ashtabula River with steelhead smolts (41,940) in 2017 due to its improved water quality and habitat. According to Kevin Kayle, Fish Hatchery Administrator of the DOW, the increased steelhead production at the Ohio Castalia State Fish Hatchery (450,000-475,000 steelhead smolts) helped facilitate this stocking. The ODW said it will add the Ashtabula River to its steelhead system stocking list for future stockings (69,928 projected for 2018). Kayle also stated that, due to lack of public access above the Hadlock Ford (which is posted to fishing) on the Ashtabula, no plans are in the works to facilitate steelhead movement past the ford. If a "notch" was configured into the ford for steelhead movement, Kayle says that it would compromise the lamprey blocking ability of the ford. Lake Erie brown trout stocking in 2017 was a 30% increase from 2016 with a total of 157,780 brown trout yearlings stocked by NY and PA. This was well above the long term average of 83,508 since 1990. This will be the last stocking of brown trout in Lake Erie by the NYSDEC. The NYSDEC will be replacing the browns with a fall fingerling domestic strain rainbow trout (see 2018 Spring Steelhead Report and News by John Nagy for more details on the termination of the NYSDEC Lake Erie brown trout stocking program). (Note: The PF&BC has now developed a captive brood egg source of IPN disease-free brown trout eggs for its brown trout stocking program. It is no longer dependent on an annual donation of brown trout eggs from the NYSDEC which, as stated above, has terminated its Lake Erie brown trout program in 2018). The 2018 Lake Erie Coldwater Task Group (CWTG), which reports to the Great Lakes Fishery Commission (GLFC), has announced that it is committed to developing a lake-wide, inter-agency, mass steelhead marking program for juvenile steelhead prior to stocking. The Lake Erie fishery agencies include the states of MI, OH, PA, NY and the Province of Ontario. The inter-agency goals of the clipping/tagging program include understanding steelhead population dynamics, including total abundance, wild recruitment, survival, natural and fishing mortality, growth, maturation and life history. Also, data obtained from the marking program could help fine tune each agency fishery by increasing juvenile survival, reduce straying, boost adult returns and expand the time span of spawning runs for specific steelhead tributary streams. Based on current lake-wide yearly steelhead smolt stocking objectives (1.875 million), the Lake Erie CWTG estimates it would cost approximately $218,700 ($0.117/fish) to clip/tag all steelhead stocked in Lake Erie on an annual basis. In July and August of 2018, the US House of Representatives and the US Senate respectively have approved funding the Great Lakes Restoration Initiative (GLRI) in 2019 with $300 million (which had been the annual funding in the past). The Trump administration had proposed a massive funding cut to the GLRI in 2019, down to an amazingly low $30 million. The purpose of the GLRI program (which was launched in 2010), is to protect and restore the Great Lakes fresh water system by fighting threats such as loss of fish/wildlife habitat, harmful algae blooms and invasive species such as Asian Carp. An initial plan to stop the migration of Asian Carp into the Great Lakes was released by the US Army Corps. of Engineers (USACE) in July 2017. The $275 million plan recommends a new electric barrier and underwater noise generation speakers to prevent carp movement through the lock and dam in the Chicago Area Waterway System (CAWS) at Brandon Road in Joliet, IL. The lock and dam at Brandon Road is considered an ideal “bottle neck” for making defenses against Asian Carp migration in the Great Lakes. The USACE will have its final plan to stop Asian Carp migration at Brandon Road sometime in 2019 with actual construction work starting not until 2025. With the clock ticking (and Asian Carp literally at the door of the Great Lakes), US Senator Rob Portman (R., OH) has inserted a provision in the America’s Water Infrastructure Act of 2018 to speed up the USACE report for Brandon Road by February 2019. Hopefully, future US Congressional/Senatorial pressure will also expedite construction for the critically needed Asian Carp defenses at Brandon Road. (Please review past John Nagy Steelhead Report and News articles in right menu bar for more background information on Asian Carp migration into the Great Lakes). 2017 wounding rates on lake trout by the NYSDEC (the traditional measure of estimated sea lamprey populations in Lake Erie), and lake wide estimates of adult sea lamprey populations, still indicate the continuing presence of a large sea lamprey population in Lake Erie (which is above acceptable target levels). PF&BC and NYSDEC surveys in Godfrey Run, PA and Chautauqua Creek, NY have shown sea lamprey wounding in adult steelhead. Sea lampreys can have a negative effect, not only on steelhead, but other Lake Erie fish species such as lake trout, whitefish, chub, and herring. The NYSDEC Open Lake Sport Fishing Survey has documented sea lamprey wounds on smallmouth bass, walleye, yellow perch and northern pike as well. A parasitic phase sea lamprey can destroy up to 40 lbs. 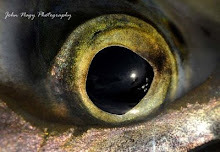 of fish during its lifetime. 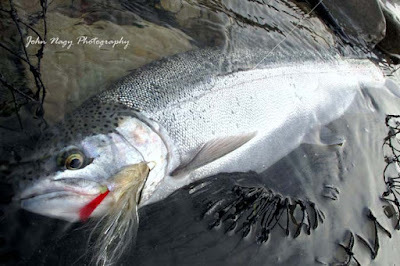 Many steelheaders have reported the steelhead runs down in recent years in the “steelhead alley” portion of Lake Erie (Ohio, Pennsylvania and New York). Several factors may be contributing to this with the high sea lamprey population at the top of the list (although catch rates reported in angler diaries from 2010-2015 showed respectable average catch rates of .35 steelhead/hour). The Great Lakes Fishery Commission (GLFC) and its control agents including the United States Fish & Wildlife Service (USF&WS) and the Department of Fisheries and Oceans Canada (DF&OC) continue to apply the Integrated Management of Sea Lamprey (IMSL) program in Lake Erie. The program annually assesses sea lamprey populations, maintains and monitors existing river barriers (including lamprey traps) in the Lake Erie watershed, reviews new river barrier projects in the Lake Erie watershed (see Harpersfield and Springville Dam barrier projects below), selects streams for lampricide treatment and implements alternative sea lamprey control methods. The Grand River was treated with lampricide (3-trifluoromethyl-4-nitrophenol (TFM)) by the U.S. Fish and Wildlife Service in 2017, and Conneaut Creek (OH), Huron River (OH) and Silver Creek (ON) are scheduled for treatment in 2018. The GLFC has found in recent years (based on larval assessments conducted from 2011-2014) that the largest source of sea lamprey production in Lake Erie is more than likely from Lake St Clair and the St Clair River versus the traditionally tracked and treated Lake Erie tributary streams. Since the St Clair system is so expansive, traditional stream lampricide treatments are unlikely to be effective. Other treatment methods, such as the sterile male program or pheromone treatments, are being considered as alternative treatment options. Steelheader's should be aware that leaf-drop will be late this year, so be prepared for leaf clutter in tributary flows later than usual (early to mid November). Cattaraugus Creek, NY has been running high this fall, but Steelheader's can still find more fishable conditions by hitting the tribs of the Cat (South Branch and Clear Creek) when the Cat is high and stained. Canadaway and 18 Mile Creeks are other options. The Norfolk Rail Road Trestle Project over the Grand River, OH (above Route 84) seems to be deterring (to some extent) steelhead movement through the work area (see below). Construction crews have installed pipes at the temporary causeway road (over the Grand/below the new trestle construction) for water flow/fish passage. There are plenty of steelhead, though, from Beaty's Landing (below Rt. 84) downstream towards Painesville, OH. The USACE is doing a feasibility study on aquatic ecosystem restoration of Arcola Creek near Madison, OH. The study will evaluate wetland restoration, creation of riparian corridors and installation of new culverts to allow for increased fish passage to spawning grounds. A Detailed Project Report (DPR), available in 2018, will address current conditions and review recommendations for potential new solutions. In 2018, work continued on the Harpersfield Dam Lamprey Barrier Project on the Grand River, OH by the United States Army Corps of Engineers (USACE) including a review of the Project Partnership Agreement (PPA) and the barrier design. Priorities for the design include an 18 inch drop between dam crest height and dam tail water elevations. Also, water flow velocities high enough to prevent sea lamprey passage during flooding events. The USACE also awarded 4.3 million dollars to the construction vendor. Construction of the barrier is targeted to begin in the fall of 2018 with completion in 2019. 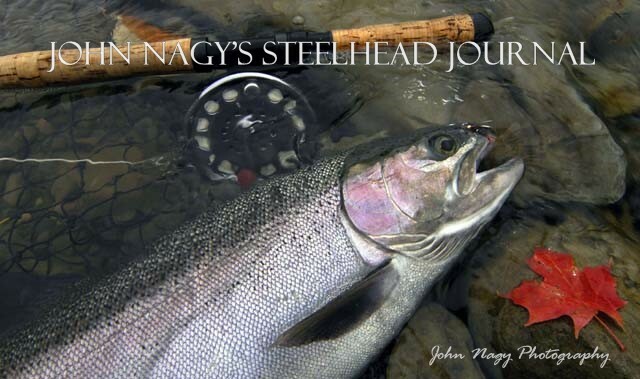 (See past John Nagy's 2015 Fall Steelhead Report and News in the right menu bar for more background information on this project). The railroad is continuing work in the construction of a new $21 million Norfolk railroad trestle on the Grand River (just south of Rt. 84). A temporary causeway road (across the river) was built to aid in the construction of the trestle. Steelheader's should be aware of restrictions in the area including no fishing/access 100 feet above (upstream) the Rt. 84 bridge and no fishing/access 1/8 mile below (downstream) Helen Hazen Wyman Metro Park. These restrictions also prohibit watercraft floating through this area during construction. Work is expected to be finished by the end of the year. See John Nagy's 2018 Spring Steelhead Report and News for more background information on this project. According to Scott Bollinger (Statewide Public Access Program Manager for the PF&BC), the PF&BC’s Lake Erie Access Improvement Program (LEAIP) is very strong right now. With 4 million dollars in the account (which came from Lake Erie Fishing Permit sales) they are actively pursuing a number of acquisitions and easements using this funding. Bollinger says that in addition to acquiring public access, LEAIP funding is also used for constructing public parking areas, installing signage, boating access and riparian and fishery management. The following are a list of projects that have been approved by the PF&BC so far in 2018. Note: It usually takes 6-12 months after PF&BC approval (and final closing with landowner) for LEAIP easements/properties to become open to the public. Once the project is formally closed, the PF&BC will mark the easements/property boundaries, with parking areas installed later. Bollinger relays that several of the easements/properties will be closed on this winter (2018). -Conneaut Creek (Spring Twsp, Crawford County), 3,960 linear feet/35 feet from stream bank, off Fisher Road north of Conneautville, PA/ $50,000 easement. -Elk Creek (Girard Twsp, Erie County), 6,325 linear feet/182.1 acres, south of Interstate 90 off of Beckman Road/$911,000 property acquisition (the PA DCNR pays $450,057 and the PF&BC LEAIP paying the balance of $460,943 with the PF&BC retaining property ownership). -Crooked Creek (Erie County), 1300 linear feet of frontage/6.27 acres, intersection of Happy Valley Road and Lucas Road/$176,500 property acquisition. -Elk Creek (Erie County), 760 linear feet/35 feet from stream bank, off of Luther Road downstream of Route 98 Bridge/$11,500 easement. -Conneaut Creek (West Springfield Twsp, Erie County), 1,165 linear feet of frontage/8 acres, off Griffey Road near West Springfield, PA/$24,500 easement. -Seven Mile Creek (Harbor Creek Twsp, Erie County), 4,960 linear feet of frontage/35 feet from stream bank, off Route 5 east of Lawrence Park, PA/$105,000 easement. -Conneaut Creek (Spring Twsp, Crawford County), 2,170 linear feet of frontage/35 feet from stream bank, located off Tower Road immediately downstream of an existing public fishing easement/$30,000 easement. -Elk Creek (Fairview Twsp, Erie County), 250 linear feet of frontage/35 feet from stream bank, located off of Luther Road across from Folly’s End Campground/$3,750 easement. -Elk Creek (McKean Twsp, Erie County), 1,900 linear feet/35 feet from stream bank, located off of West Road immediately downstream of the PF&BC’s Rick Road Access/$26,000 easement. The PF&BC and North East Township, PA will collaborate on a handicapped accessible fishing pier near the mouth of Twenty Mile Creek. The project will also include paving part of the parking lot at the North East Conservation Park and a handicapped accessible walkway from the lot to the fishing pier. The project is expected to be completed in the fall of 2018. The PF&BC has an ongoing voluntary annual logbook survey to collect quantitative data from the steelhead and brown trout fisheries in the tributary waters of Pennsylvania. The data collected will include fishing effort (time fished) date(s) fished, numbers of steelhead and brown trout caught, location(s) fished, size of fishing party. Anglers will also be able to record optional data including fishing conditions, bait/lure used, and notes describing fish caught, etc. for their own personal angler diary. This data enable will be used to compute catch rates, track returns of the fishery over time and evaluate the efficacy of recent changes to steelhead rearing and stocking. LECAL data collected so far has enabled the PF&BC to estimate the catch per hour of steelhead for the prior four seasons (0.329, 0.468, 0.325, 0.336, and 0.607 fish per hour for the 2013/2014, 2014/2015, 2015/2016, 2016/2017, and 2017/2018 seasons, respectively). The PF&BC is seeking data from anglers of all skill levels, including anglers who make many fishing trips and those that only make one or two trips. This helps to lessen the avidity (i.e. skill) bias inherent in fishery estimates derived from voluntary surveys. Participants are asked to record data from each fishing trip as soon as possible after their trip has ended to minimize recall error (i.e. errors in recollection that may increase with time), and to include data for unsuccessful trips (zeroes count too!). This survey requires very little time and effort to complete. Anglers will be provided with a logbook and a stamped, addressed return envelope along with simple, clear instructions. Once all logbooks have been received and all data entered and processed, logbooks will be returned along with a report of each angler’s catch statistics and those of all other participating anglers (participating anglers’ data will remain anonymous). And periodically, when available, will include commission patches along with logbooks as a reward for participation. The PF&BC hopes anglers will consider participating in this survey, and by doing so, contribute valuable data which will help to improve the Pennsylvania steelhead and brown trout fishery. If you are interested in participating in this survey, please send via email your name, mailing address, and phone number (optional). If you do not have an email account, you can also call the PF&BC. The Springville Dam Ecosystem Restoration Project on Cattaraugus Creek, NY is currently in the engineering and design phase. The Project Partnership Agreement (PPA) was signed by the USACE, NYSDEC and Erie County, NY in 2017. The NYSDEC says that possible construction could begin as early as 2019 (after the sea lamprey spawning run) but more likely in 2020 or 2021. The selected plan for the project will lower the existing spillway from 38 to 13.5 feet to serve as a sea lamprey barrier. A 15 foot wide rock riffle ramp with seasonal lamprey trapping/sorting capability is included in the design. Requests from the National Historic Registry will be fulfilled by preserving a portion of the original spillway on both banks to show the original structure. In the meantime, James Markham, Senior Aquatic Biologist with the NYSDEC, has relayed that a new research project in some of the major tributaries of Cattaraugus Creek (upstream of the dam) has begun in order to determine possible impacts to the local fish community once the steelhead pass over the dam. The research project will include pre-fish data (collected prior to fish passage over the dam) and regular collection intervals (every 2-3 years) after fish passage over the dam. Markham says that the NYSDEC has decided to maintain the current inland trout regulations above the dam, meaning that it will primarily be Catch-and-Release, Artificial Lure Only from mid-October until April 1. This keeps in line with the NYSDEC Steelhead Management Plan (completed in 2016) to promote natural steelhead reproduction when practical. On a side note, Markham reports that New York Lake Erie open lake anglers have seen a big increase in steelhead catches the first couple weeks of September which bodes well for the upcoming tributary steelhead fishing season. See past John Nagy Fall Steelhead Report and News for background information on this project. According James Markham of the NYSDEC, the Chautauqua County Soil and Water Conservation District (CCSWCD) is working on removing an old dam (including stream restoration) on Silver Creek at Smith Mills, NY. Construction for the project is projected to be in 2019 sometime (presently a hydraulic study is being done by a consultant and then it will go for NYDEC permitting review this winter). Markham says that the dam removal has the potential to open up some of the best habitat on Silver Creek to steelhead but since the stream is small and habitat limited it will not have major impacts as far as steelhead natural reproduction goes. Of course, new steelhead fishing opportunities will open up as a result of the dam removal. More detailed information on fly fishing for Great Lakes Steelhead can be found in John Nagy's classic book "Steelhead Guide, Fly Fishing Techniques and Strategies for Lake Erie Steelhead." (Now available in an eBook version!). 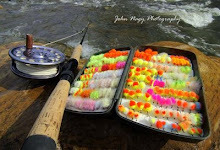 His new "Steelheader's Journal" makes a great companion book to the Steelhead Guide. Both books (including eBook) are available by going to the right menu bar for ordering information.